Blue Lizard Australian Sunscreen is made with a unique micronized Zinc Oxide that allows the protectant to form an even barrier against UV rays. Many other popular sunscreens are less technologically advanced—they don’t blend onto the skin as easily and don’t stay on as long. It is a common misconception that higher SPF means more sun protection. That’s simply not true. Each Blue Lizard formula offers more that 30 times your skin’s natural protection against UVB rays. If applied correctly, SPF 30 is all you need! 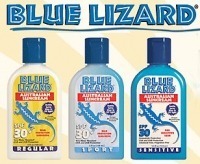 Blue Lizard Australian Sunscreen is a favorite among all the Northshore Dermatology staff members.